The geology of the Keddy Nature Sanctuary (KNS) is presented here very briefly based primarily on existing maps and publications which present and discuss the bedrock and surficial geology of the regional area in which the KNS lies. Published information was supported by visits to outcrops along Highway 7 west of the site and a visit in the fall of 2017 when the Keddys provided an enjoyable tour of some parts of the Sanctuary to view the geology and ecology. The KNS is underlain by Precambrian age rocks (older than 542 Ma, marking the beginning of the Cambrian Period) which form a part of the Grenville Province which was formed by a series of northwest directed continental collisions resulting in overthrusting (when parts of one plate are thrust over the adjoining plate) and imbrication along the eastern part of North America. This occurred during a period when an ancient supercontinent named Rodinia was being formed (Figure 1). 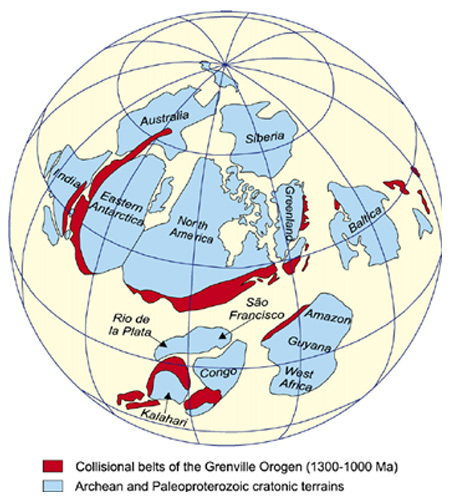 Rocks of the Grenville Province date from about 1250-980 Ma and formed an impressive mountain belt in the central part of Rodinia prior to this early supercontinent breaking apart by about 650 Ma. Erosion has reduced these ancient mountains to their current state. Figure 1: Approximate configuration of the ancient continental cores (cratons –shown in blue) forming Rodinia about 1 Ba and the collision belts where Grenville-age mountain building occurred (Teixeira et al 2007). In Ontario the Grenville Province has been subdivided into 3 sections, generally from west to east. 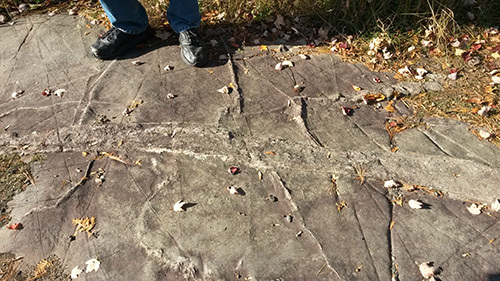 These are the Central Gneiss Belt to the west, the Central Metasedimentary Belt and the eastern Granulite terrane (see Figure 2, although the Figure does not extend far enough to the east to show the Granulite terrane). Eastern Ontario is underlain by rocks of the Central Metasedimentary Belt formed primarily by volcanic and sedimentary rocks which were subject to magmatic intrusion (intrusion of molten material) between about 1.4-1.1 Ba and underwent regional metamorphism (subject to heat and pressure resulting in changes to the mineralogy or texture of the original rock but without melting the rock to a liquid state) approximately 1090-1060 Ma. Figure 2: The Grenville Province in eastern Ontario (Corfu and Easton, 1997). 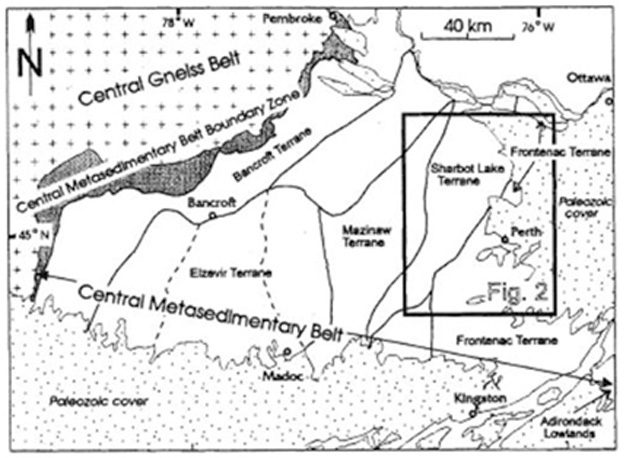 The Metasedimentary Belt has been further subdivided into a number of terranes (Figure 2) of which the Sharbot Lake and Frontenac terranes are of interest to us. The boundary between the two terranes lies just to the west of Highway 7 on the west side of Mississippi Lake with the Sharbot Lake terrane lying to the west and the Frontenac terrane lying to the east and underlying the KNS. The two terranes are separated by the Maberly Shear Zone, a deep seated structure (fault) resulting from active movement along the boundary of these plates during and after the amalgamation of these two terranes. Frontenac rocks were thrust over the eastern Sharbot Lake terrain in the period 1170-1160 Ma. Geologically, the rocks of these two terranes are quite distinct, with the Sharbot Lake terrane being composed primarily of marbles (metamorphosed limestones and dolostones) with lesser amounts of metavolcanics, metamorphosed silicilastic (sandstones, siltstones, shales composed primarily of silica) rocks and numerous igneous intrusions. The Frontenac terrane is composed primarily of metasedimentary gneiss, quartzite and marble which have been subject to plutonic intrusions in the period 1190-1160 Ma. A younger suite of plutonic intrusions occurred throughout the Metasedimentary Belt in the period 1080-1060 Ma. Metavolcanic rocks are noticeably absent in the Frontenac Terrain. The Sharbot Lake terrane represents an island arc sub-continent (volcanic areas separated by ocean in which sediments accumulate such as we currently see in the Ring of Fire in the Pacific Ocean. These regions mark areas where subduction is occurring resulting in the rise of molten lavas.) while the Frontenac terrain represents an area of more generalized platform sediment accumulation without volcanic activity. Note the exposure of Frontenac Terrane in the “study area” of Corfu and Easton (Figure 2) which extends under the KNS. Bedrock mapping of the area including the KNS has been carried out by a number of geologists with compilations presented in maps 1362A and 1508A by the Geological Survey of Canada. Detailed work in the area has also been carried out by the Ontario Geological Survey and others with a 1997 paper by Corfu and Easton providing an excellent summary of the local bedrock geology including age dating of contemporaneous rocks exposed along Highway 7 just to the west of the KNS. The KNS property itself is underlain by a migmatite which can be defined as bedrock which is a mixture of metamorphic and igneous rock. It is created when a metamorphic rock such as gneiss locally melts, and then that melt recrystallizes into an igneous rock, creating a mixture of the unmelted metamorphic part with the recrystallized igneous part. This migmatite consists of a quartzofeldspathic to biotite gneiss of unknown origin (but probably siliciclastic sediment) grading to a granitic pluton, reflecting a high grade of metamorphism. The biotite gneiss contains 10-35% granite melt stringers and granite veins (see Figure 3). Age dating indicates this migmatization and plutonism occurred between 1169-1166 Ma. Just to the west of the KNS, outcrops along Highway 7 consist of gneiss, quartzite and marble breccia. Corfu and Easton (1997) interpret the geologic sequence to be marble at the base which was overridden by quartzose sediments then by hot gneissic and meta-plutonic rocks associated with migmatization and plutonism. 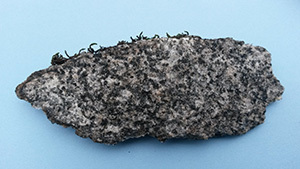 Figure 3: Biotite gneiss with granite stringers and veins. The granite in places is coarse grained and would be termed a pegmatite. Mapping (and our field excursion) has identified small areas of mafic (dark coloured) hornblend amphibolites on the property. The protolith (source rocks prior to metamorphism) for these rocks is unknown but they may represent inclusions in the migmatite. The Quaternary geology of the KNS area is quite simple, with bedrock exposed throughout much of the area or overlain by thin deposits of glacial till and soil. 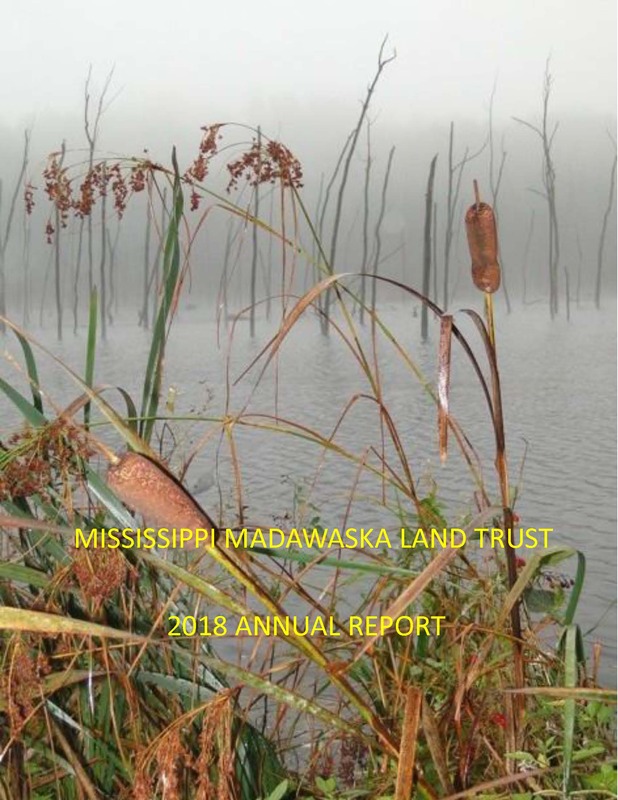 Undoubtedly the wetland areas are underlain by recent organic deposits and perhaps silt/clay directly overlying bedrock but these areas have not been mapped. We did observe some interesting erosional features related to glaciation such as rounded hummocky bedrock exposures with ice wedging in fractures having separated the bedrock along the edges into blocks, many of which have been transported by ice to some extent. Easton, R. M. 2017. Insights into the Tectonic and Metamorphic Architecture of the Composite Arc Belt and the Frontenac-Adirondack Belt near Perth, Ontario, Grenville Orogen: A Geological Guidebook; Ontario Geological Survey, Open File Report 6330, 54 p.